There ain't nothin' more powerful than the odor of mendacity ... You can smell it. It smells like death. Oh, you weak, beautiful people who give up with such grace. What you need is someone to take hold of you--gently, with love, and hand your life back to you, like something gold you let go of--and I can! I'm determined to do it--and nothing's more determined than a cat on a tin roof--is there? I'm not living with you. We occupy the same cage. The human animal is a beast that dies but the fact that he's dying don't give him pity for others, no sir. 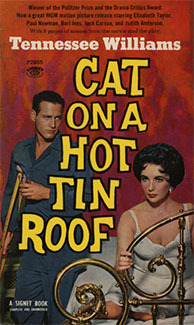 What is the victory of a cat on a hot tin roof? -- I wish I knew ... Just staying on it, I guess, as long as she can.